Although many may say that this post is purely and exclusively female, I notice that men are also able to identify with the creatures of today we will talk. Is that this is the butterfly tattoo, those insects which suggests delicacy and beauty that can only be printed in the skin of a woman, but anyone can wear a cute butterfly on her skin, male or female. There are many legends about the living, among which stands out that speaks of the butterfly as a symbol of love, freedom and wants to fly to become reality. The truth is that the butterfly tattoo are very popular among women, can also be seen in men, but to a lesser extent, and often intimately tied to personal meaning. 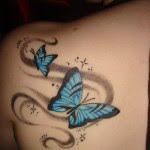 The size of this type of tattoo, in most cases is small, but this depends on which part of the body where it is affixed, as are often different designs butterfly tattoo on the back that are perhaps more size. The areas of the body that are often seen this kind of tattoo are: hands, feet, shoulders, lower back, and groin. The most beautiful and striking of butterfly tattoos is the range of colors that can be used since it is one of the main characteristics of this insect, its color.